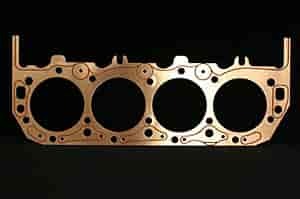 SCE Gaskets Titan Self-Sealing Copper Head Gaskets Bore/Thickness: 4.320" x .062"
The first self-sealing copper head gasket... perfect for performance applications and racing! SCE's Titan Self-Sealing Copper Head Gaskets need no sealant; they provide unbeatable strength and user-friendly installation. This patented product offers the best of both worlds: the combustion sealing strength of an SCE copper head gasket and the confidence of built-in coolant & oil seals. Must use with O-rings. 2/pkg.